When a systems or email administrator logs into the Control Panel, the first thing that he or she will see is system information for the last 12 hours. The composition of the email stream is broken down into its component parts: clean, virus, spam, WBL, RBL, Spam Traps and Client-Host Blacklist. 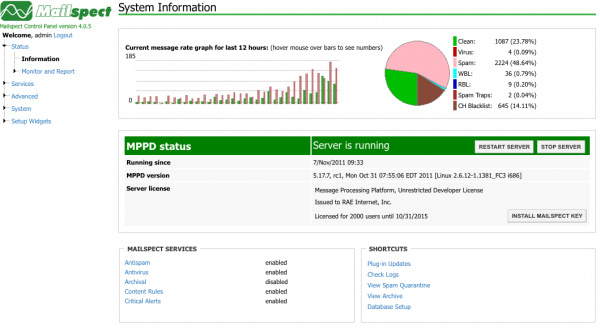 The System Information panel also shows the status of the Mailspect daemon, called mppd. When the ‘Server is running’ that means that all of the configured antivirus and antispam scanning engines as well as the connections to external resources are working and that micro-updates of new virus signatures and spam fingerprints are occurring in background. The System Information screen also lists of the services with their enabled/disabled state as well as a shortcuts to other frequently visited components of the solution. 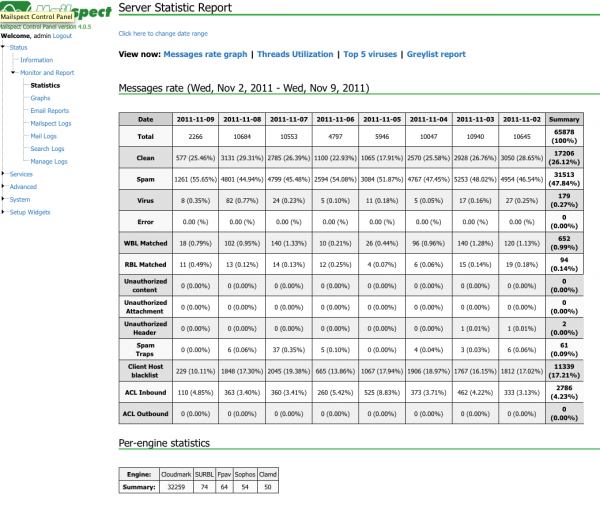 If more information is required, then the email administrator can view the Server Statistic Report page. The screen shows the message rates or volumes for the past week and a breakdown of the email stream by: clean, spam, virus, error, WBL matched, RBL matched, unauthorized content, attachment, or header, spam traps, client host blacklist, access control lists inbound and outbound. Statistics are also presented that display the mail filter engines — Cloudmark, Spamassassin, Mailshell, SURBL, F-PROT, Sophos, ESET or Clamd — that are identifying the spam and infected emails. Via the Control Panel, the email or systems admin can monitor, configure update dozens of email security and system parameters and functions. The Control Panel menu is organized by: Status, Services, Advanced, System and Set-up Widgets. Under each category, the features are listed and available via a graphical user interface. Most sub-menu screens have ‘essential’ and ‘advanced’ sections. Under Services, the admin can control Connections to external resources like real-time reputation lists as well as Antivirus, Antispam, Content Inspection, Access Lists and Utility settings. These Services are used to tell Mailspect Defense how to handle viruses and spam as well as block offensive words and undesirable attachments. Disclaimers or ‘group’ email signatures are composed and applied in the Utility screen. The Advanced category includes many features that were added over the years for specific customers. The Policy Engine facilitates the creation of groups of users who share common access to resources and system settings. Policies are particularly useful for ISP or email service providers who want to provide different scanning regimes or content filters to different customer groups. The Scanners panel is where the email admin can the sequence of up to six different engines that will process the email stream. Thresholds are where rate limits are set to protect against bursts of spam from specific IP addresses, domain, users or content fingerprints. Message Tracking and Message Stores are used to determine exact how an email was processed by the system and are used to locate the cause of ‘false positives’ in the scanning pipeline. Reject Templates facilitate the composition of bounce-back messages to blocked IP or email addresses. The System category provides oversight of the important setting and connections used to optimize the functionality and performance of the solution. Finally, Setup Widgets are provided to facilitate the implementation of other solution components based on typical default settings. Because Mailspect Defense is so feature rich, we expect our customers to start simple and fast and then steadily add more and more sophisticated features to their email security environment. Free of charge, our support team will consult with you on how to accomplish your email security goals in the most efficient way using Mailspect Defense’s robust functionality and gradually train you on the system. 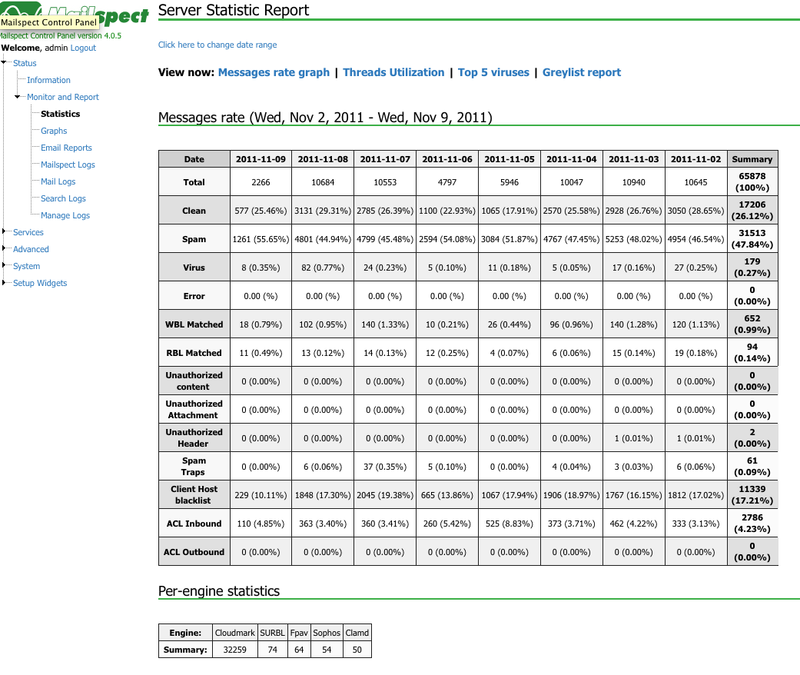 Mailspect Defense updates are provided via a dedicated FTP site or APT for Debian and Ubuntu or YUM for Red Hat. While updating the underlying operating system and middleware, Mailspect Defense can be selected at the applicaton level and updated simultaneously.